An up-to-date evidence-based presentation on the evaluation of PRFs (mainly, P-PRF and L-PRF) use and application for oro-maxillo-facial tissue regeneration, from high-quality Randomized and Controlled Clinical Trials. Thus, in vitro, in vivo and case report studies were intentionally excluded from analysis. 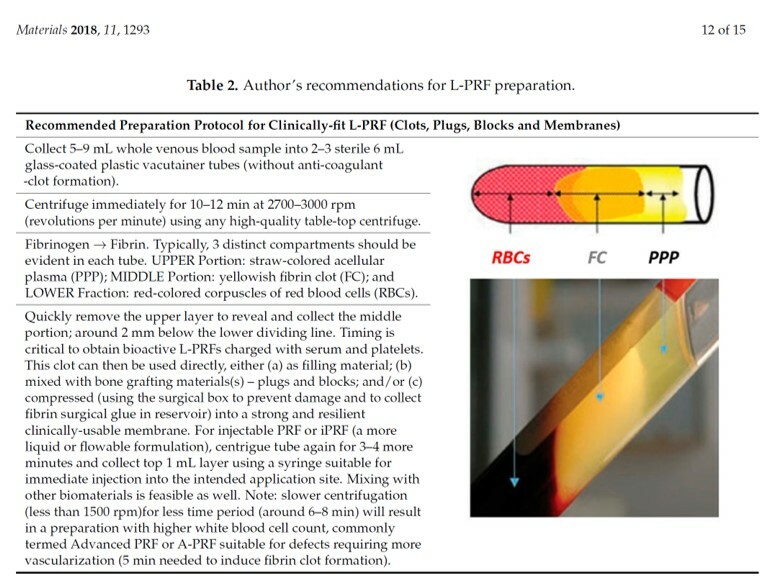 Platelet-Rich Fibrin (PRF) is a three-dimensional (3-D) autogenous biomaterial obtained via simple and rapid centrifugation from the patient's whole blood samples, without including anti-coagulants, bovine thrombin, additives or any gelifying agents. At the moment, it is safe to say that, in oral and maxillofacial surgery, PRFs (particularly, the Pure Platelet-Rich Fibrin or P-PRF and Leukocyte- and Platelet-Rich Fibrin or L-PRF sub-families) are receiving the most attention, essentially because of simplicity, cost-effectiveness and user-friendliness/malleability; a fairly new “revolutionary” step in second generation therapies based on platelet concentration, indeed. Yet, the clinical effectiveness of such surgical adjuvants or regenerative platelet concentrate-based preparations continues to be highly-debatable, primarily as a result of preparation protocol variability, limited evidence-based clinical literature and/or poor understanding of bio-components and clinico-mechanical properties. Accordingly, reports often associate autologous PRFs with early bone formation and maturation; accelerated soft-tissue healing; and reduced post-surgical edema, pain and discomfort. An advanced and original tool in regenerative dentistry, PRFs (clots, plugs, membranes, scaffolding biomaterial, injectable and/or implantable/packable, alone or mixed with other grafting components) present a strong alternative and presumably cost-effective biomaterial for oro-maxillo-facial tissue (soft and hard) repair and regeneration. Yet, preparation protocols continue to be a source of confusion thereby requiring revision and standardization. Moreover, to increase the validity, comprehension and therapeutic potential of the reported findings or observations, a decent analysis of mechanico-rheological properties, bio-components and their bioactive function is eagerly needed and awaited; progress towards a brand-new era of “super” oro-dental biomaterials and bioscaffolds for use in oral and maxillo-facial tissue repair and regeneration, and beyond - an ongoing topic (and line) of research, development and innovation at BioMAT'X (Laboratorio de Biomateriales, Farmacéuticos y Bioingeniería de Tejidos Cráneo Máxilo-Facial): http://www.uandes.cl/facultad-de-medicina/biomateriales-laboratorio-de-ingenieria-de-tejidos-craneo-maxilo-facial.html. Tissue regeneration and anatomical reconstruction and repair in defects of the oro-maxillo-facial complex have been consistently a critical and controversial concern. Both, quality and quantity of the regenerated tissues are important to consider, aesthetically and functionally. Practically, the surgeon is faced with an ample collection of regenerative techniques and materials to choose from. How can one select the “ideal” or “best-fit” strategy and procedure to meet the most favorable clinical outcome? Evidence-based studies? Level of scientific evidence? This review, to the best of our knowledge, is the first concerning Randomized Controlled Clinical Trials on PRFs use and application in specific Oral and MaxilloFacial Surgery procedures, bridging the gap between the clinical and the materials expert. While the available literature is found to be highly-limited, PRFs can still be indicated as an innovative tool for contemporary oro-maxillo-facial tissue regeneration and bioengineering. Indeed, existing evidence suggests that PRFs improve early wound healing and promote post-surgical bone formation/maturation. However, it is noteworthy that a clearer consensus seems to be present regarding its significant beneficial impact on post-surgical pain and discomfort control, regardless the type of procedure. Unlike its predecessors, new PRF preparations tend to function more as biologically-active biomaterials and scaffolds for autologous cell, growth factors and cytokines delivery. Thus, PRFs should be considered a “living tissue” preparation for natural guided tissue regeneration and not simply a “growth factor-rich” surgical adjuvant. Yet, it is safe to say that this remains an un-explored territory in Dental Biomaterial (Dental BioEngineering) Research, in general. Currently, our group (BioMAT'X, Centro de Investigación e Innovación Biomédica - Faculties of Medicine and Dentistry, Universidad de los Andes, Santiago de Chile) is investigating the potential of (a) incorporating mesenchymal stem cells derived from oro-dental routes and (b) core-shell nanoparticles loaded with growth-factor(s) and incorporated or embedded within the PRFs, as “super” or “smart” bio-scaffolds, to further promote soft tissue healing, bone generation, treatment time, post-surgical stability, and outcome predictability, in advanced oro-maxillo-facial surgical procedures such as Periodontally-Accelerated Osteogenic Orthodontics (PAOO) and mental genioplasty/chin augmentation. Further, in the context of invasive surgical procedures such as third molar extraction and cysts resections, the ultimate objective of our research focuses on the potential of PRFs in decreasing the need for prescription drugs. Finally, we are vigorously working on characterizing the rheological properties and biological variations of PRFs, alongside partnering up with nurses, physicians and dentists to standardize the preparation protocol, for use in other therapeutic indications, including orthopaedics; in an effort to address and resolve the underlying challenges and limitations outlined earlier herein slackening their clinical translation.